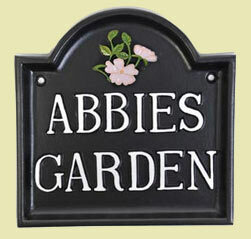 Cast Metal Name Plates which do not rust or corrode. Production time is six to eight weeks as each one is handmade in one piece. Powder coated for a durable weather-proof finish. 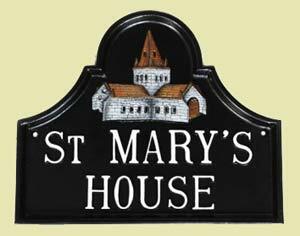 These arch top house signs are made from aluminium which will not rust or corrode and is designed to last a lifetime. 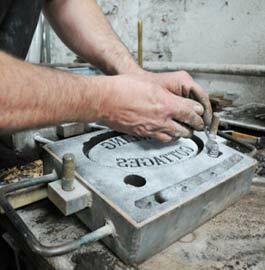 To achieve the raised lettering and a high relief motif each sign is individually cast using the traditional sand casting process. 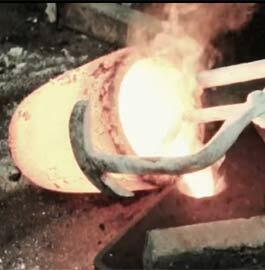 The foundry-men make a mould of the sign into which the molten metal is poured. After cooling, the mould is broken open and the sign removed. It is then cleaned, primed and powder coated. The last stage is the hand painting of the lettering and motif. When used for house number and house name, the number looks good in the top of the arch,with the house name below it. Again though, if you have specific layout idea - do let us know. Made in the UK. 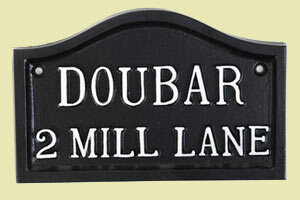 Our team at The Sign Maker looks forward to helping you with your cast metal name plate or house sign.